Hamilton's first foray into automatics was in 1953 with the introduction of the Hamilton Illinois brand. Up until 1953, all of Hamilton's movements were made in the USA but post-war Europe was creating a lot of high quality movements at low price points - so competition in the watch industry was tough. Many American companies folded during this time of the last century, or they were acquired by other companies. In fact, Hamilton survived a hostile takeover by rival Benrus! Hamilton reintroduced the Illinois brand that it had acquired in the 1920's. Conventional wisdom has it that they reintroduced the brand in order to protect their trademark, but I think it may also have been a way to test the market and introduce Swiss-made movements into the Hamilton line - albeit one step removed. If it failed, it would be an Illinois-failure and the "true Hamilton" reputation would be unblemished. What's ironic is the Swiss-grades were the first to introduce automatics, calendar complications and shock jewels into the Hamilton model line. So despite the price point, the models introduced were highly innovative. Well, it turns out that time is time, regardless of what continent made the movement. The Illinois label was dropped in 1955 and Swiss movements were introduced into Hamilton's entry-level line up of watches in rolled gold plate and gold fill. Regardless of case material, all automatics have Swiss-made movements. 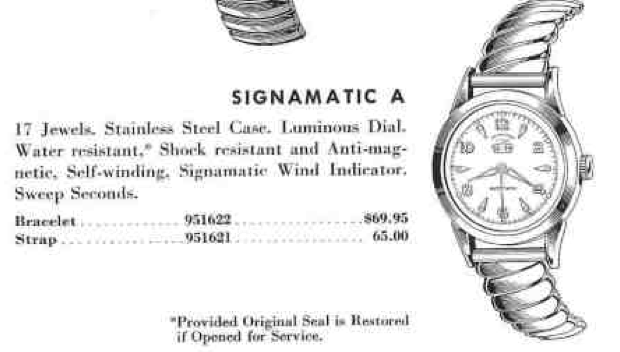 One of the early Hamilton Illinois watches that has always intrigued me was the 1953 Signamatic. I'm not exactly sure how you're supposed to say it though… is it Sig-na-matic or Sign-a-matic? Regardless, it's an interesting model because it has an up-down indicator, aka wind indicator (as in wind a watch and not the wind blows). So there's a little dial under the main dial to show how much it has been wound and thus, how much run time the watch should have left. 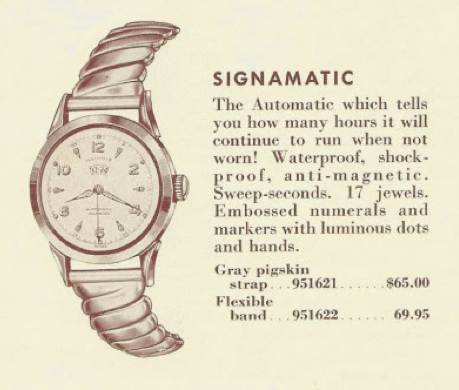 In 1954 a couple of other dial options were added and the Signamatic was broken into the Signamatic A and the Signamatic B. Other than the dial options and bracelets, I'm not entirely sure what other differences there might be. It does look like the case on the Signamatic B has slightly shorted lugs. As you can see, the Signamatic comes in a stainless steel case with luminous hands and luminous dots applied to the hour markers. Under the dial is an ETA 1256 variant - set up with the additional parts needed to drive the wind indicator. These watches tend to sell above my usual project watch target price. Up until very recently, I've never successfully snagged one. But I finally got lucky and got one that arrived non running with a missing crystal - which is odd since it was listed as running and with a crystal. Go figure. The case back is screwed on - normally they're not too hard to get back off. Notice the 9516 number. 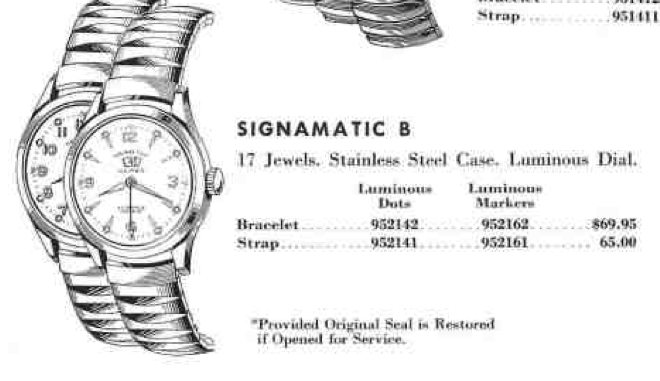 I believe this is the model number of the watch as other Illinois automatics have similar numbers like 9514 and 9515. Here's the ETA 1256 - this is a common movement from the 1950's and you'll see it in a lot of other brands. At the time, ETA was an "ebauche" maker - and made partially assembled movements in a variety of grades and other companies could complete them, add their logos, etc. The stem and two case screws hold the movement in place - plus, in my case, some crystal cement - which I had to bust loose in order to get the movement out. Once the movement is out, I can get to work removing the hands and dial - so I can finally see what makes the wind indicator tick - if you pardon the pun. Well - here you have it. There's a tiny dial over the hour wheel and an extra spacer plate to create the space needed for the extra parts. The geared wheel at the top is on the lengthened mainspring arbor - which passes through the main plate. The dial just lifts right off. With the wind indicator out of the way, it's starting to look familiar - but I need to remove the spacer plate next. Notice it has a spring wire. I suspect it helps keep the dial indicator in place so it's properly driven by the other gears and stays at 40 when it reaches the maximum wind tension. Getting closer to looking like a typical movement now. Next to come off are the wheels on top of the mainspring barrel area. They have to come off to get to the hour wheel in the center. There are actually three sets of gears stacked in that assembly. There's one more gear in the upper left to take out and then all that is left are the parts that any traditional movement will have on the dial side of the main plate. The post on the second hand came off the hand when I removed it. So I need to take the post off and hopefully not lose it before I re-attach it to the second hand. The post is not supposed to come off the hand - but it does happen occasionally. With the front clear of parts, I can turn my attention to the back. The first thing off is the rotor assembly. Three screws hold it in place. The rotor assembly has a series of gears to transmit the motion of the rotating pendulum to the winding wheel on the barrel bridge. With the rotor out of the way, this looks like an average ETA manual winding movement now. With the bridges out of the way, you can see that there's an extra gear under (or on top of) the barrel that brings the motion of the mainspring arbor to the front of the main plate (via the gears we already removed). Wow - this is a lot of parts. I have to admit I was a little concerned that I would forget where everything is supposed to go. That's one reason why I took so many pictures. Everything gets cleaned and oiled like you've seen me do before and the now working movement goes onto the timer. It's running pretty well. The "noise" in the middle under 2.7ms is me fussing with the movement holder. I had to refer to my photos a couple of times but I managed to get everything back together without any extra parts left over. I relumed the hands and even-numbered hour markers, installed a fresh crystal and a nice lizard strap and this watch is ready for wrist time. Nice! Great job and great watch! Thanks for sharing.